They're a bit late, but Android tablets with quad-core processors are coming this year, according to Jen-Hsun Huang, Nvidia's chief executive. The chipmaker expects Android tablets supercharged with quad-core chips to hit shelves in time for Christmas, according to a Wall Street Journal report, but smartphones powered by these chips are unlikely to show up until next year. 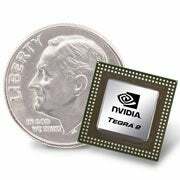 The quad-core chips from Nvidia will be twice as powerful as the Tegra 2 chips, which power 70 percent of Android tablets today. Nvidia's quad-core chips, first announced in February, are meant to be twice as fast the company's Tegra 2 processor, currently found on about two-thirds of Android tablets from Motorola, LG, and Toshiba. The new breed of tablets was supposed to arrive this summer, but Nvidia's chief executive said manufacturers are taking their time "getting the industrial design as wonderful as possible, and some of it is related to tuning and performance." However, there is another reason why quad-core Android tablets are late to the game. Most Android tablets manufactures are faced with meager sales compared to Apple's iPad. They are already struggling to match the iPad's pricing and battery life while incorporating current dual-core chips; using a more powerful (and probably more expensive and more power-hungry) processor would make achieving their goal even more difficult. Manufacturers have yet to announce any quad-core products. In the smartphone market, where Android models dominate the iPhone, quad-core processors were supposed to arrive by Christmas of this year, but Huang didn't say whether Nvidia is still on track with that schedule. Qualcomm and Texas Instruments, which make competing chips for smartphones and tablets, expect their quad-core chips to be featured in devices hitting shelves early next year. Huang also revealed that Nvidia's chips would power some Windows 8 tablets and PCs later next year. Microsoft is set to showcase Windows 8 next week, and--according to Huang--the new OS will be able to run applications developed for its Windows Phone 7 OS as well.